01.08.07 Are Fun and Work Oxymoronic? Rejuvenile made a brief appearance Monday morning in the first hour of ABC’s “Good Morning America” in a story about play at the workplace. Here’s the gist of the GMA piece: work is boring. A few office monkeys are fighting back with inter-department playground slides, break room foos-ball tables and other goofy innovations. Cue remark from yours truly on the importance of play and fun in the workplace and how these changes reflect the larger rejuvenile phenom. All of which is nice enough, but I’ve got to say the story stirred the harrumphing codger in me—apparently, play at work is all about M&Ms and Nerf basketball. In our interview, I tried to emphasize that too often, the merry chattering bosses who institute “playful” reforms are putting window dressing on salt mines. There is little more infuriating than having a Wacky Fun Day hosted by an employer who skimps on health insurance or restricts family leave. I don’t think there’s any doubt a genuinely playful attitude toward work can benefit both worker and the bottom line, but it’s not about bouncing balls or bobbleheads. It’s about doing our work with the same wonder and imagination and sense of fun that too many workers ditch in the name of professionalism.
? The Play Ethic - Pat Kane’s brilliant manifesto on the end of the old protestant work ethic was published last year in the U.S. and contains many dazzling, scholarly ideas about having fun in the name of productivity.
? Adultitis - Jason & Kim Kotecki offer a free, step-by-step program of practical tips on loosening up and sparking childlike wonder in the midst of an adult life. -ou can do better than a depressing bowl of M&Ms on your desk. 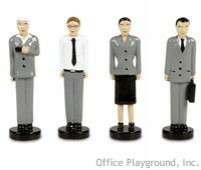 Check out Office Playground for the best in cubicle doo-dads. Get thee a desktop sandbox! First, we talked cupcakes. Now, we talk business. Rachel Kramer Bussel, whose online presence is deliciously split between a blog about cupcakes and a blog about erotica, did a very nice piece this summer on the cupcake blog about rejuveniles and food. Where did you first get the idea for The New York Times “rejuvenile” article and how long did you spend researching it? Did you have plans to turn it into a book at that time? Were there more things you wanted to explore and chronicle than you had room for in the Times piece? ?I’d been freelancing for magazines and newspapers for seven-odd years when I started thinking seriously about writing a book—I felt my attention span getting longer and was itching to tackle a big, amorphous topic. The idea for Rejuvenile grew out of questions I was asking myself, and things I saw around me. At the time, I was dividing my time between freelancing and taking care of two little kids. I discovered that caring for small children gave me license to play tag, splatter paint, eat Popsicles and do all sorts of things I was sure would be listed as felonies in the “Official Adult Rule Book.” Talking first to other parents and then to a number of other adults, I was shocked to find I wasn’t alone—grown-ups all over were indulging their inner children like never before; the meaning of maturity had fundamentally changed without much reflection or comment. I approached a few agents with the idea but was mostly met with “call us back when you have a proposal.” Betsy Amster—a former editor at Pantheon and Vintage, who now runs an independent agency here in L.A.—was the exception. She loved the idea, helped me plan and shape the proposal, and advised me on what material to concentrate on for a sample chapter. Hoping to turn a freelance assignment into a sample chapter, I pitched editors I’d worked with at The New York Times with a story about adults who love kiddie music—I’d just seen a band called Gwendolyn and the Goodtime Gang do a set of rock covers of “Itsy Bitsy Spider,” and “Bingo” for an over-21 club and had talked to collectors who specialized in weird old kids records and thought it would make a good [“Sunday Styles”] feature. They liked the music idea, but were way more interested in the larger phenomenon, and ended up assigning a general trend piece. After the rejuvenile story ran on the front page of the “Sunday Styles” section, I spent another month fleshing out the proposal, eager to submit it while the story was still relatively fresh. In the end, I didn’t do a sample chapter at all, opting instead to do a detailed overview and lengthy chapter summaries (which, of course, changed when I got the deal and actually began writing). ?To my enormous relief, the proposal was picked up within the first week. Three publishers expressed interest, though Rachel Klayman at Crown/Random House was the most enthusiastic. She made an offer within 24 hours. There was a date set for an auction but, in the end, the other publishers elected not to compete with Crown. In your book proposal, how much of your research plans were mapped out? ?I did a lot of advance research for the proposal, referencing basic demographic, marketing sociological data that supported my thesis, and including interviews I conducted while reporting The New York Times piece. These research plans changed significantly once I started work—I altered four chapter topics, added three others and rearranged material. Do you have any advice to first-time nonfiction authors? Is there anything you’d have done differently, either from a financial standpoint or a journalistic one? ? It’s become a clich?, but it bears repeating: Your job is only half-done once you’ve finished the book. Your publisher or agent or publicist can be helpful with promotion but, ultimately, it’s your job to get the word out. This extra work has its benefits—it’s great to connect with readers, and hear how your ideas land in a larger market—but it’s hard to make the switch from writing and reporting to hustling and promoting. 08.16.06 The Cupcake Press Speaks! In a world of vast uncertainty, here’s a rock-solid guarantee: spend five minutes scrolling through this Blog and your salivary glands will start squirting like a SuperSoaker. Five minutes more and a weird rush of dizzy expectant energy will begin rushing from your tummy-region to your fingers and toes. Five minutes more and you’ll be scrambling for your car keys and heading toward that fancy new neighborhood boutique bakery that’s doing an astonishingly brisk business in? gourmet cupcakes. You know the one ? Sprinkles (Oprah’s choice in Bev Hills) or Magnolia (The West Village shop immortalized in SNL’s ?Lazy Sunday?) or Love at First Bite (the Berkley boutique famous for its strawberry strewn Pretty in Pink). With its vivid close-ups and gushing captions, Cupcakes Take the Cake (motto: ?all cupcakes all the time?) is the Hustler Magazine for the cupcake crowd. Authors Rachel Kramer Bussel, Alizinha and Nichelle are hot n? savvy New Yorkers who serve up the most exotic and gorgeous kiddie deserts ever — the junky “care bears cupcake” that would cause conniptions in a four-year-old to a sublime “green tea, lavender and honey bombe” (pictured here) suited for the most urbane chowhound. What I love about cupcakes is, first of all, how they invite such pure and unadulterated appreciation in adults. Other things I studied—from classic toys to comic books to kid games like dodgeball and rock paper scissors—have been rediscovered with heavy helpings of irony or kitsch. Not so with cupcakes. The very sight of a well-frosted made-with-love cupcake instantly triggers a happy, wondrous childlike response. 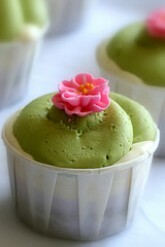 Gorgeous, tasty and quickly consumed, cupcakes are icons of kidhood. And as an added bonus, many of the masterminds creating cupcakes are bringing whole new levels of sophistication and artistry to a treat that’s for too long been thought of as junky supermarket food. -‘m appearing on the teevee program ?Life & Times? tonight on KCET in Southern California at 6:30 pm (repeats at 1 am). Correspondent Saul Gonzalez and I wandered around L.A.‘s Griffith Park for one their signature uncut, verite-style interviews. - had a funny conversation on Friday with Kai Ryssdal of NPR’s “Marketplace” about rejuveniles, play in the workplace and the color of my sneakers. Archived here. -he wacky K.C. ad gang at the Brandshow devoted an hour to the topic for their weekly podcast. Streaming version online here.
? ?Jill Sarjent at Reuters wrote a nice feature on the book that went out on the wires Tuesday. Fingers crossed it gets the word out ?round the world?
? ?The book was cited on Monday in a funny, unusually thoughtful Minneapolis Star-Tribune story on weird games.
? The Austin Statesman interviewed me last week for a story on adult kickball. The daily in Ann Arbor, MI, took their turn at bat Monday. I’ll be reading from the book and signing copies at my neighborhood bookstore in Los Feliz, CA this Sunday, July 9, at 5 pm. This is the only reading I have scheduled; if you’re in the area, come on down. Skylight Books, 1818 N. Vermont (next door to the movie theater). I just taped an interview with the CNN show ?In the Money? in which I was quizzed about the book, the big question (?is a good or bad thing? Can it be both??) and how businesses are reaching the rejuvenile consumer. The interview airs this Saturday, July 8, at 1 pm Eastern, 10 am Pacific (show repeats on Sunday 3 pm Eastern, 12 Pacific). I’m set for an hour-long conversation this Monday, July 10, on the Philadelphia NPR affiliate WHYY’s program ?Radio Times? (which is also broadcast via satellite on Sirius). I’ll be appearing on the national NPR show ?Talk of the Nation? on Tuesday, July 11. Check here for showtimes in your area. Back home now after the exhausting, exhilarating NY media blitzkrieg, which included more than a dozen radio interviews, a smattering of TV chats and a big finish Thursday with an appearance on one of my favorite shows, The Colbert Report. Of all the media I’ve done so far, I was sweating this most of all ? I count Colbert as one of the smartest, most fearless guys on TV today and I had no idea what he’d made of me or this book. I’m still not sure where the rejuvenile phenomenon falls in the political-cultural continuum, and was even less sure how it might translate for such a deeply ironic, blazingly smart performer. Anyhow, I needn’t have worried. It was the polar opposite of the Maher experience a few weeks back ? Colbert hung out in the green room beforehand (his advice: ?I’m willfully ignorant; it’s your job to disabuse me of that? ), was funny without being cynical, and in the end took aim at neither me or the book but the grumpiness of TV pundits around anything in the least nuanced (?Is it a bad thing or not? We like to tie up my stories in a nice little bow around here?). Especially after the Today Show?s wholeheartedly perky treatment the day before, it was nice to get message out that the phenomenon cuts both ways, from the wondrous upside of childlikeness to the ugly escapism of childishness. And unlike the truly depressing backstage spread at the Today Show (veggie platter, Skippy peanut butter), the Colbert dressing room was stocked with booze, cookies and a genuinely awesome gift bag (coupons for free shoes, vodka and a bag stocked with Altoids of every conceivable flavor)? The interview is posted on the Comedy Central site (Windows Media Player required), on a page with a bunch of other recent segments. Look for my smirking mug. There’s also two good radio interviews available online. The first is a 20-minute chat with a sympathetic radio guy in St. Louis on all aspects of the phenomenon. The second, for the syndicated Money Matters Financial Network, is all about corporate attention to the rejuvenile market. I promise to get back soon to posting actual ideas rather than self-referential media updates. It’s just been that sort of week? The Mark Maron Show. Air America, AM 1160 in L.A. 10 pm to midnight. Streaming here (requires Windows player). I’ve also started posting blog entries on HuffingtonPost.com. First one is here. Shameless self promotion! Shameless, I tell you! Rejuvenile arrives today in bookstores all over this fair land. I’m thrilled, relieved and more than a little astonished. It’s a real book! In actual stores! First-week sales are a big deal in the publishing biz, so I’ll be forever grateful to those who pick up a copy soon. Help spark the rejuvenile movement! Support your local independent bookstore! I’ll be in New York next week for the Today Show, NPR’s “Talk of the Nation” and Colbert (yikes! ); there are also stories, interviews and reviews in the works for the Wall Street Journal, the Detroit Free Press and the Weekly Standard (expect a drubbing from the neocons). USA Today ran a story today on the cover of the Life section. A wildly effusive thank you to all the friends, family and kindred spirits who’ve played a part so far. I have no idea how the book will be received, but for now I’m just happy the book is out and in the world. BusinessWeek jumped the gun and published a review of the book today, two weeks before it’s actually released. I’d be bitter, if their assessment - cheekily titled “Adults Do the Darndest Things” - wasn’t so complimentary and comprehensive. Three-and-a-half stars! “Breezy” and “provocative”! I’ll take it! The harrumphing codgers will surely weigh in soon, but today I’m just grateful the book was greeted so graciously by the MBAs at BusinessWeek. One thing I wished I’d said: rejuveniles aren—t, as Mr. Maher seems to believe, a bunch of stoners who stay at home all day in Speed Racer T-shirts playing Halo on the X Box. The vast majority of the people profiled in the book are responsible, respectable adults with families and careers and a commitment to maintaining a childlike, playful, imaginative part of themselves. In fact, many rejuveniles find that their childlike tendencies enhance their adult — ‘re often better parents, more creative and productive workers and just plain happier people. One big bonus from the experience: I got a goodie bag! No fancy gadgets or free vacations, but this morning I’m drinking my grown-up coffee from a new Fishbowl mug. Thanks Bill. Hope the hollering out front doesn’t bother you; feel free to come play whenever you like? The Orange County Weekly has a cover story about so-called “Man Babies,” adult men who are ?held in an internal stasis; they age, but they do not develop as much as repeat.? Writer Chris Ziegler was inspired to coin this latest neologism (see also: grup, kidult, twixter, and, oh yeah, rejuvenile) after observing dads and their sons at a local mall dressed in identical baggy jeans, floppy T’s and “fat marshmallow tennis shoes.” The story is mostly about how dramatically the adult male dress code has changed from masculine and formal to boyish and casual. Men who a generation ago would have never left the house without a coat and spiffy shoes are now showing up at work in Quicksilver shorts and flip-flops. Ziegler includes a few chin-strokey remarks from yours truly, along with a terrific interview with a marketing exec at OP, the sportswear manufacturer famous for its laid-back Jeff Spicoli aesthetic. The most faithful OP customers are guys aged 15-24, but the brand also enjoys a loyal following among men over 35 who simply never “grew out” of OP. I’m not crazy about the “Man Baby” moniker, of course. The men he’s describing don’t seem particularly babyish ? more like Man Teens. Beyond that, I wonder why he left women out of the — about all the mall rat moms running around with Forever 21 capris and Hot Topic T—s? A few eons ago (August 2003, actually) I wrote a story for the Sunday New York Times about what I called “a new breed of adult.” It was an outlandish idea, but it grew out of an honest attempt to understand a number of strange, surprising cultural currents I felt swirling around me. I wondered about the cross-generational appeal of Harry Potter and SpongeBob SquarePants, the adult rediscovery of games like kickball and minigolf, the sudden popularity of cupcakes as gourmet treats, the number of twenty- and thirtysomethings who still lived at home and the ascendancy of parents (myself included) who played and bonded with their kids in ways that I was certain would have been considered ridiculous a generation ago. These were not stunted adolescents, I was sure. They were something else: rejuveniles. It’s especially gratifying, then, that I’m back in the Times this Sunday writing about many of the same ideas, just a few weeks before the book is published. And doubly gratifying to launch this website and blog to continue the conversation. The Times story isn’t about rejuveniles per se, but it touches on a few central — ‘s about the blurring of age norms in big-budget Hollywood movies, and how in contrast to the “family” or “kid” movies of yesteryear, today’s would-be blockbusters define a new cultural space, in which traditional notions about age mean little. In an age when more adults than ever flock to the latest from Pixar, X-Men 3 or Superman Returns, filmmakers are now working hard to probe for the child in the adult and the adult in the child. I had a chance to talk with filmmakers Bryan Singer, M. Night Shyamalan and Jared Hess, who shared their thoughts on what Singer called ?the intense pressure of trying to make a film that plays 8-80 but isn’t so soft it alienates the 8-13?s.? We also talked about their own conception of adulthood and what it means that so many grown-ups are now so entranced by movies that on the surface appear designed for kids. I’ll post more of their thoughts here in the coming week. In the meantime, welcome. I hope you’ll stop by here often and add your comments (or better yet, fill out a questionnaire and post your picture in the Profiles section!). I can’t tell you how excited and gratified I am to share these stories and start what I hope will be a long and lively conversation.